What is in a name? Data center, computer room, server room? Most people probably think they are all basically the same thing. The names seem interchangeable, right? Wrong. When a business is determining what is best to manage and facilitate their data it is important to distinguish between the common names and assess what is best. For a long time, if a business was large enough, it was common to utilize the services of a data center rather than attempt to manage IT infrastructure in house. This was for a variety of reasons but they often boiled down to three things: proper backup power, cooling ability and adequate space. Many businesses simply did not have the ability to properly supply backup power to maximize uptime. Additionally, due to the existing structure of their building, proper cooling was often a challenge and lastly, working with existing office space often meant that there was just not enough room to house IT infrastructure or outgrowth happened very quickly. But, as happens very quickly with IT, technology changed. As technology changed, needs shifted and it has left many businesses wondering what is better, an in-house computer room or an outsourced data center? For small, and potentially even some medium size businesses, it may be possible to have an in-house computer room solution for managing and storing data. But, this depends on a great many things. For one, it depends heavily on the existing structure with which you have to work. Does your office building have adequate space to house all of the necessary IT infrastructure, backup power and cooling systems? If you are able to essentially shrink all of the components of a larger data center into a smaller computer room application to fit your businesses needs then it may be ideal to keep it in house. After all, by bringing it in house some security threats could be avoided and IT budget may be easier to manage. The problem is, many offices are not capable of accomplishing this and, barring moving your entire office to accommodate a new computer room, it is often more practical and ideal to outsource to a data center. In addition to consider existing capabilities it is also important to consider future needs. Do you anticipate a lot of growth for your business, additional data to manage or significantly increased IT infrastructure needs. If so, do you have the room to manage more server racks or the ability to cool more dense server racks appropriately? Finally, it is critical that you either have personnel capable of effectively managing your computer room and all of the moving parts that come along with that or are prepared to hire personnel that can do it. 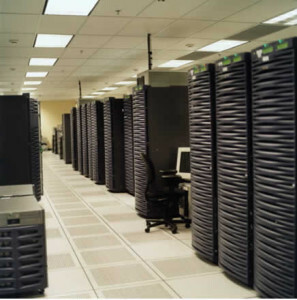 For most, it is still ideal to opt for a data center over an in-house computer room to ensure data is secure, managed and properly backed up and to maximize uptime for your business. This entry was posted in Back-up Power Industry, Computer Room Design, Data Center Build. Bookmark the permalink.